(CNN) When Sri Lanka's government first looked to develop a port on its southern coast that faced the Indian Ocean, it went not to China, but to its neighbour, India. Then-Sri Lankan Prime Minister Mahinda Rajapaksa said he urgently needed funding to transform the harbour of his hometown and asked Indian officials for help with the project. 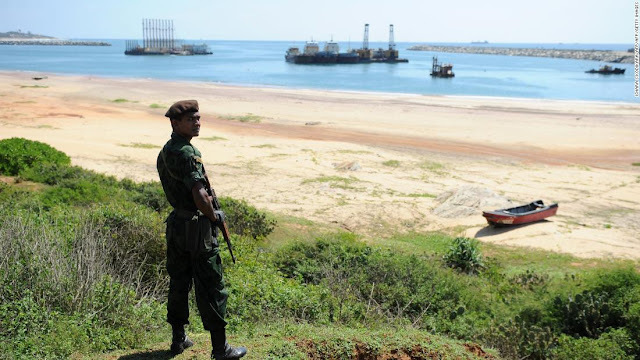 New Delhi showed little interest in funding a costly and massive port construction project in the underdeveloped fishing village of Hambantota, a district that had been crushed by the Indian Ocean tsunami in 2004. "It was offered to India first. 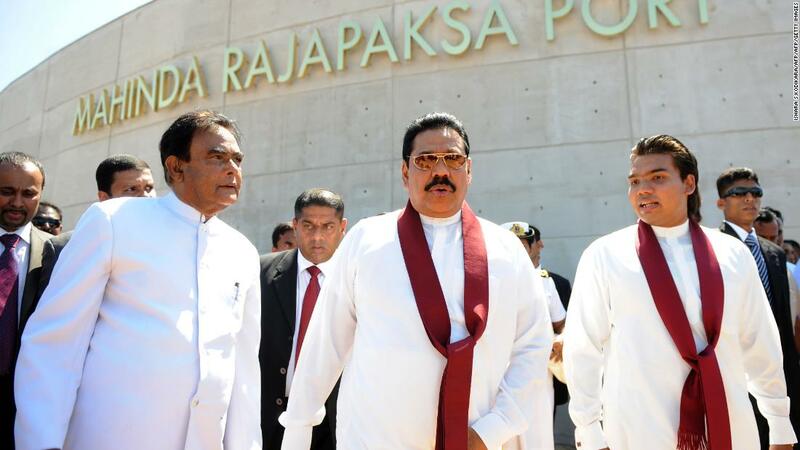 I was desperate for development work, but ultimately the Chinese agreed to build it," Rajapaksa said in an interview with Singapore's Straits Times in 2010. Beijing invested $1.5 billion in 2010 to build the port. The venture was considered economically unviable and indeed, in the years that followed, the port sat empty and neglected, and Sri Lanka's debt ballooned. But India's economic foresight might have cost it in terms of strategic geopolitics, since the debt incurred on the port and the surrounding infrastructure undertakings now belong to its great rival. China's official licensing of the port in December last year gives it yet another point of access over a key shipping route, and the prospect of providing it with a sizeable presence in India's immediate backyard and traditional sphere of influence, bringing China closer to India's shores than New Delhi might like. 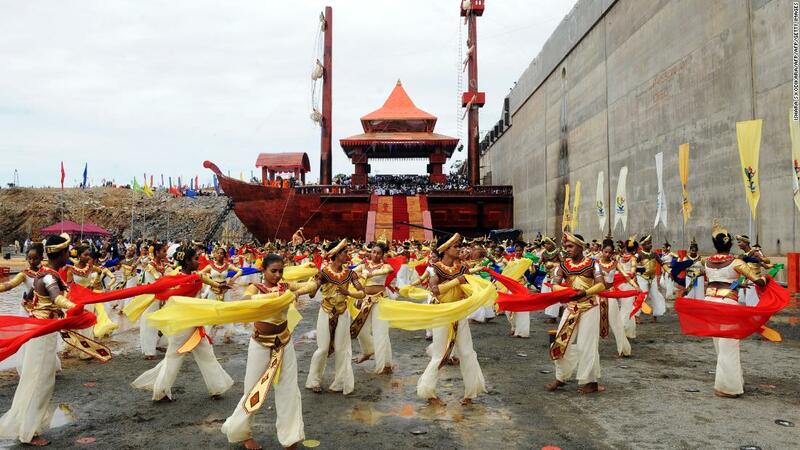 Sri Lankan dancers perform at the site of the Hambantota port during a ceremony marking the first phase of construction, August 15, 2010. Moreover, Sri Lanka's decision to sign a 99-year lease with a Chinese state-owned company for the Hambantota port to service some of the billions it owes to Beijing has some observers concerned other developing nations doing business with China as part of China's One Belt One Road initiative might fall into similar financial straits. A trap, they warn, that may well have them owing more than just money to Beijing. "China is, in many cases, the only party with the interest and the capital to deliver on these projects," said Jeff Smith, a research fellow on South Asia at the Heritage Foundation in Washington DC. "The relevant question for everyone is: at what cost?" 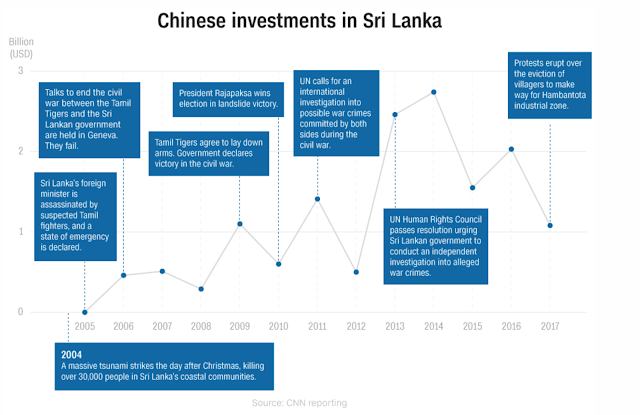 China has for decades invested in Sri Lanka, particularly during moments in recent history when much of the international community held off. 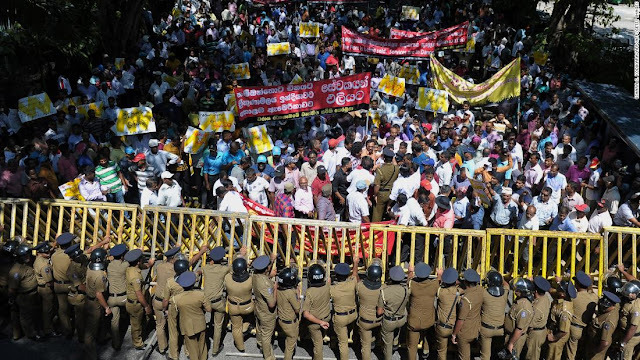 As the European Union sought to punish Sri Lanka over human rights abuses during the decades-long civil war between government forces and the Tamil Tigers, China acted on its behalf diplomatically at the United Nations. It also supplied the Rajapaksa government with military aid and it promised to spend to rebuild the country's damaged infrastructure. India had also sent in military help, but nowhere near the levels Beijing dispatched. The civil war ended in 2009. Between 2005 and 2017, China spent nearly $15 billion in Sri Lanka. By comparison, the International Finance Corporation, which is part of the World Bank group, says that between 1956 and 2016, it invested over $1 billion. Jeff Smith points out that along with the Hambantota port investments, Beijing loaned Sri Lanka $200 million in 2010 for a second international airport and a year later a further $810 million for the "second phase of the port project." There was more. $272 million for a railway in 2013 and more than $1 billion for the Colombo Port City project, ventures that hired mostly Chinese workers (one Sri Lankan report put the number of Chinese workers dedicated to projects in 2009 at 25,000), and all with money Sri Lanka could barely afford to repay. 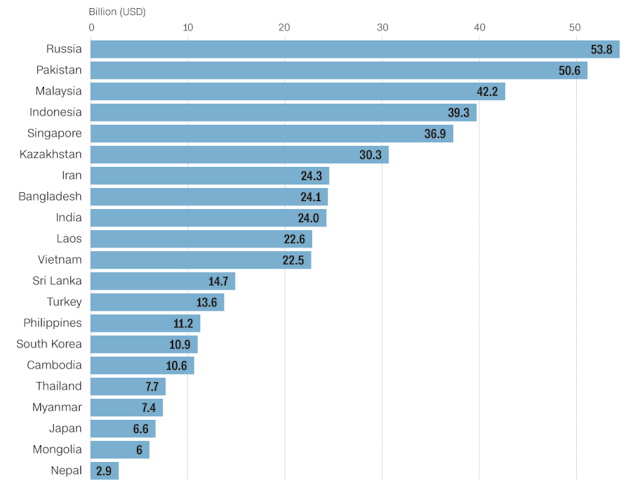 By 2015, Sri Lanka owed China $8 billion, and Sri Lankan government officials predicted that accumulated foreign debt -- both owed to China and other countries -- would eat up 94% of the country's GDP. After an equity swap, an IMF bailout and more control over the projects ceded to Beijing, the terms of the debt were restructured, giving Sri Lanka some breathing space. In 2017, however, the Hambantota port proved too costly for Sri Lanka to sustain. "They (the Chinese) called in the debt, and the debt has been paid by Sri Lanka giving them the (Hambantota) port. That port then gives them not only a strategic access point into India's sphere of influence through which China can deploy its naval forces, but it also gives China an advantageous position to export its goods into India's economic sphere, so it's achieved a number of strategic aims in that regard," said Malcolm Davis, senior analyst at the Australian Strategic Policy Institute in Sydney. "This is part of a determined strategy by China to extend its influence across the Indian Ocean at the expense of India and it's using Sri Lanka to achieve it," he said. Details of the new agreement between China and Sri Lanka have not been made public. The port is an "important project aimed at spurring local economic growth based on equality and mutual benefits," according to the Chinese Ministry of Foreign Affairs. It declined to answer further when asked by reporters. Construction workers operate heavy equipment at the base of Sri Lanka's Hambantota port August 1, 2010. Some 350 Chinese staff helped in the first phase of construction. 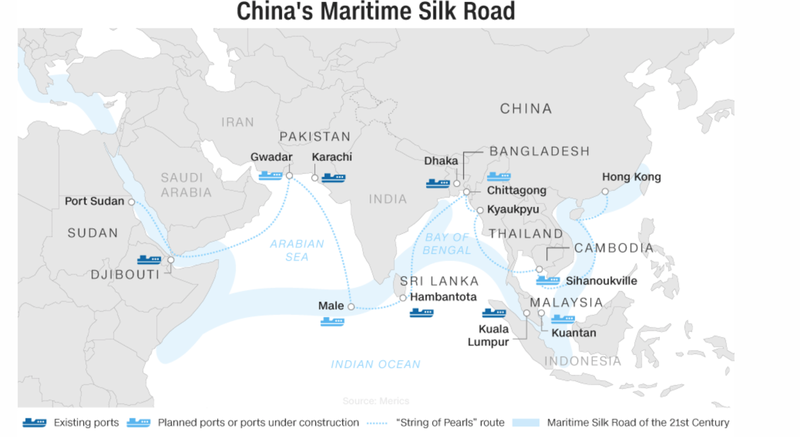 China's claiming of controlling stakes in strategic ports along critical shipping lanes -- what analysts have taken to referring to as its "string of pearls" -- beginning at the Straits of Malacca and dotting the Indian Ocean, should signal Beijing's ultimate ambitions, said Davis. "There's a bigger picture here, that the more you invest in the Belt and Road initiative, the more the Chinese are in a position to force your country to align politically in terms of policy," Davis told CNN. "So you become dependent on their investment and their largesse, and you're less likely to be critical of them and you're more likely to accommodate their interests strategically." China launched its ambitious One Belt One Road (OBOR) development strategy in 2013, investing in projects that include thousands of miles of highways in Pakistan, an international airport in Nepal and a rail link between China and Laos. The initiative would come to span more than 68 countries and encompass 4.4 billion people and up to 40% of global GDP. Consisting of two distinct parts, the Silk Road Economic Belt would stretch from China to Europe and include a host of trade and infrastructure projects, and the 21st Century Maritime Silk Road would be a sea-based network of shipping lanes and port developments throughout Asia and the Pacific. Beijing's other potential partners are finding difficulty with some of their own joint projects. Last November the government in Nepal scrapped a $2.5 billion deal with a Chinese company to build the biggest hydropower plant in the Himalayan country because of "irregularities" in the award process. The current Nepalese government, which had replaced the cabinet that had approved the earlier deal, announced the contract would instead go to a state-owned Nepali company. 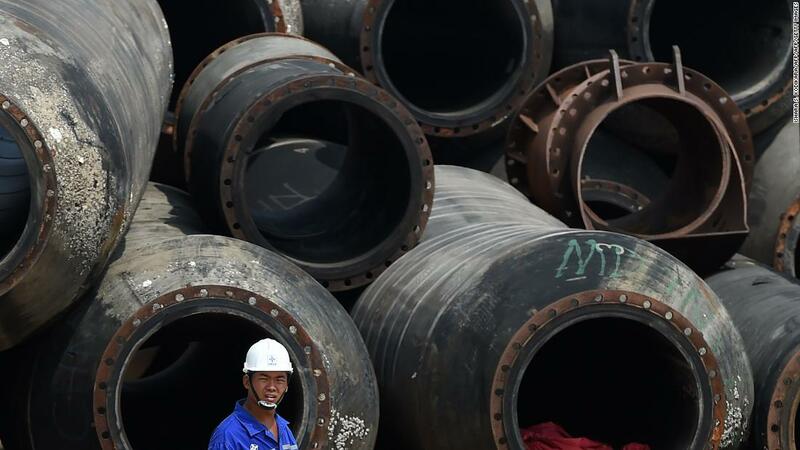 In Myanmar, a $3.6 billion dam project has stalled. The then-military backed government suspended work on the Myitsone dam in the north of the country in 2011, with talks regarding its future ongoing. Pakistan withdrew from a $14 billion agreement with China for a dam last November because the conditions of the deal included China taking ownership of the project and were "not doable and against our interests," Pakistan's Water and Power Development Authority chairman Muzammil Hussain was quoted as saying. Like Nepal, Pakistan has since indicated it would also look to shoulder the cost of the dam rather than go to an outside investor. China's Ministry of Foreign Affairs claimed to be unaware of this when asked about the situation by reporters in Beijing in December. The country's top economic planning agency later said that the two countries were discussing cooperating on the dam project but that there'd been no discussion of proposals to move it forward. The agency said "Pakistan media's reporting on this project has been inaccurate, or only represented the views of certain officials." But China is still spending in Pakistan. It is building a hydroelectric power station in the Rawalpindi district, and it is developing the port of Gwadar, strategically located on the Arabian Sea. In Malaysia, China is spending $7.2 billion on a new deep sea port in the Straits of Malacca and working on infrastructure projects on the country's eastern seaboard. China's trade deal with the Maldives government included investments in developing the international airport and a bridge, but the Maldives in return has taken on a significant number of controversial loan obligations. Last July, former President Mohamed Nasheed said the loan interest the traditionally Indian ally pays to service its foreign debt to China is more than 20% of the country's budget. He said that part of the deal included China's receipt of 16 "strategically located islands" in navigation sea-lanes. 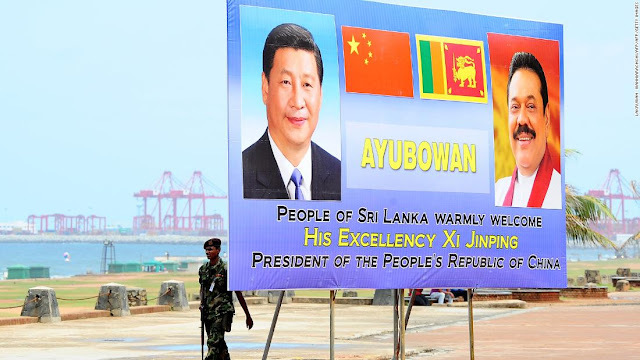 A Sri Lankan soldier walks past a billboard bearing portraits of Chinese President Xi Jinping and Sri Lankan President Mahinda Rajapakse, ahead's of Xi's visit to the Sri Lankan capital Colombo, September 15, 2014. Dean Cheng, a senior fellow at the Heritage Foundation in Washington, DC, said that the initial wave of Chinese investments in the Indian Ocean, the so-called string of pearls, was largely driven by economic considerations. The investments, he said, "would facilitate economic growth, which would benefit Chinese companies. Moreover, the construction projects would entail Chinese workers (a feature of most Chinese projects abroad, bringing their own work force), and create a demand base for Chinese goods." At the same time, he said the Chinese are clearly intent on creating a friendly political network of states. "There's nothing inherently dangerous about political considerations in economic investments," he told CNN. "It would be foolish to think that any state is wholly driven by economic considerations." The ever-encroaching Chinese presence into India's sphere of political and economic influence has been noted, but so far, says Manoj Joshi, New Delhi purports to be unruffled, as long as Hambantota remains a commercial port, and no Chinese naval vessels suddenly appear in the vicinity. "In 2014 a Chinese submarine was spotted in Colombo harbor and that was the first time we saw that and the Indian side was a bit concerned," said Joshi, a distinguished fellow at the Observer Research Foundation in New Delhi. At the time Indian defense officials expressed "serious concern" to their Sri Lankan counterpart, and naval chiefs from both countries met to discuss the incidents. Then-Defense Minister Arun Jaitley said the government "keeps a constant watch on all developments concerning our national security and economic interests and takes necessary measures to safeguard them." A Chinese submarine and a Chinese warship were allowed to dock at the Colombo port in November 2014, just under two months after another Chinese submarine called into the same port. At the time both China and Sri Lanka dismissed New Delhi's concerns, saying the vessels were on refueling stops during anti-piracy missions. Colombo port regularly hosts ships from numerous navies, including the US. 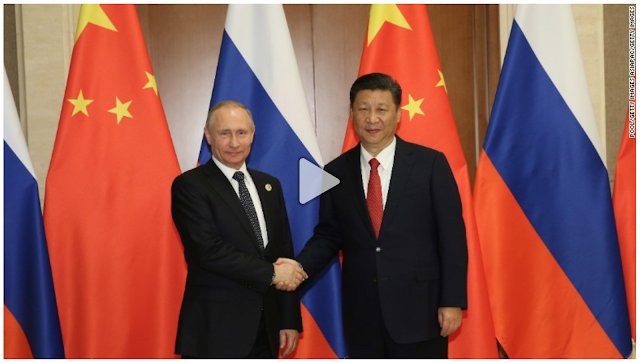 But as China's own navy becomes more 'blue water' [as in, able to move in open oceans around the world and not just in its own surrounding waters] these appearances will be more commonplace. A Sri Lankan commando stands guard on the Hambantota construction site, November 18, 2010. "It's geopolitical competition and India sees itself as the foremost nation in Asia and with the Chinese building a port, building and airport, building roads in Sri Lanka, they've emerged as big investors there and the Indians are obviously feeling somewhat nervous because India doesn't have those kind of resources to compete with," Joshi told CNN. "What we worry about is, we already have a border problem with China and now that competition goes to the Indian Ocean region. That could be against our interests." India and China share a 2,500 mile-long border, and have regularly faced off over perceived intrusions on each other's terrain as well as activity in uninhabited territory claimed by China and Bhutan, an Indian ally. "Everybody talks about China and India being major rivals, I think China doesn't see India as a genuine long-term rival, I think it looks at India and sees a classic case of democracy gone wrong," said Yvonne Chiu, assistant professor in the politics department at the University of Hong Kong. "India is incredibly corrupt, its infrastructure is terrible, and it is riddled with religious and demographic problems," she told CNN. "Except it is very large. It does have a big population as well and it's on the border. So it's a regional rival, but I don't think they take India seriously as a global rival." 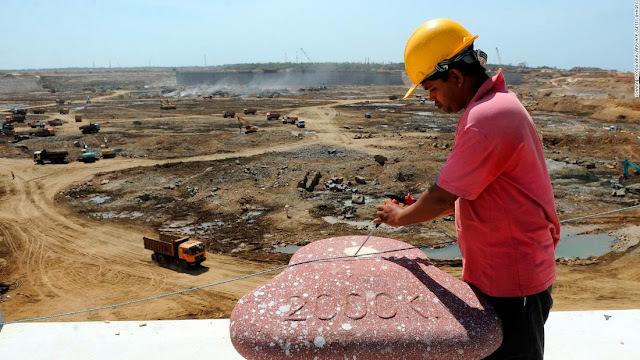 Sri Lanka's President Mahinda Rajapakse, center, flanked by his eldest son and parliamentarian Namal Rajapakse, right, and Prime Minister D. M. Jayaratne, left, tour the Hambantota construction site, November 18, 2010. For its part, India is now taking an active interest in Hambantota. The government of Prime Minister Narendra Modi is reported to be in talks with Sri Lanka about taking over the airport near the port, which was built using Chinese funds that Beijing itself wants to manage and is pushing for control with the Sri Lankan government. During a media briefing last November, Raveesh Kumar, an official spokesperson for the Ministry of External Affairs, would only say that New Delhi has "a lot of developmental projects" going on in Sri Lanka and declined to elaborate further. Colombo has yet to make a decision involving the airport. And New Delhi continues to actively participate in large-scale naval exercises in regional waters alongside allies Japan, and the US, and into the future, possibly Australia too, all to Beijing's continued consternation. Last year's Malabar exercises in the Bay of Bengal involving the US, Japan and India were the largest the region has seen in more than two decades. "India, of course, remains highly influential in Sri Lanka, and would not look kindly on any effort to pressure the government on matters related to defense and national security," said Jeff Smith. "Nor would the Sri Lankan military, which values its exchanges with the US." Modi will be in Singapore in June, attending the Shangri-La dialogue, an annual meeting of defense ministers, military chiefs and defense officials from the Asia-Pacific. His keynote address will be carefully watched for words on China's maritime expansion. South Asia's problems are not on Washington's radar right now, says Hong Kong University professor Chiu. The White House has much of its focus -- along with a substantial naval presence -- directed towards the Korean Peninsula and the ongoing crisis there. And while the US is distracted, China is slowly and incrementally changing the seascape in the Asia Pacific. China claims disputed islands in the South China Sea as part of its territory and has been militarizing some of those islands, reclaiming land on others and turning sandbars into islands to assert sovereignty over the area. "Everything that they do, like building these islands (in the South China Sea) and stuff that is illegal internationally, but nobody wants to get into a conflict over, it adds up and you have a new status quo and it's too late to do anything about it," Chiu said. "China can't afford to go to war over anything ... it would most likely lose against a major power ... but these kind of small incremental things, people will let them get away with. As long as they're patient, it could have the same effect as going to war." Even as China has taken the long view, Dean Cheng argues it's never too late for the US and its allies to do something to counter Beijing's ambitions. "The US, in cooperation with India, Japan and possibly the European Union, could offer alternative financing," Cheng said. "They could help train local officials, lawyers, etc, to become better negotiators. They can push for transparency, especially in Chinese-sponsored institutions to make clear the terms of the loans, payback processes, as well as how contracts are rewarded." Sri Lankan police stand guard during a protest in Colombo against the lease of the loss-making Hambantota port to China, February 1, 2017. Last October US Secretary of State Rex Tillerson gave a speech on the US relationship with India. Tillerson said it was up to New Delhi and Washington to "do a better job leveraging our collective expertise to meet common challenges while seeking even more avenues of cooperation." "We must also recognize that many Indo-Pacific nations have limited alternatives when it comes to infrastructure investment programs and financing schemes, which often fail to promote jobs or prosperity for the people they claim to help," Tillerson said. "It's time to expand transparent, high-standard regional lending mechanisms, tools that will actually help nations instead of saddle them with mounting debt." Tillerson told reporters that during the East Asia ministerial summit in August that the US had started "a quiet conversation with others about what they were experiencing, what they need." However, he also admitted Washington's constraints. "We will not be able to compete with the kind of terms that China offers," said Tillerson. "But countries have to decide, what are they willing to pay to secure their sovereignty and their future control of their economies? And we've had those discussions with them as well." China's resources are nowhere near as limited as the US and its allies, says Yvonne Chiu from the University of Hong Kong. "Right now, it can play on multiple fronts at once," Chiu notes. "And they take a very long view. If you're a power like the US, you're really far away. That distance is going to limit how much attention you can pay to the region. The US has to pick and choose and it's chosen East Asia. So, unless something really major happens, that's probably where their attention is going to stay." A Chinese worker at the construction site of a Chinese-funded $1.4 billion reclamation project in Colombo, Sri Lanka in October 2017. As 2017 wrapped up, the Chinese state news agency Xinhua published a dispatch from Colombo, describing how the Hambantota port was "now racing along a developmental fast-track." Chinese and Sri Lankan workers were building a highway north of the port, along with a bridge, and the Chinese Harbor Engineering Company is negotiating with the Sri Lankan government to develop a Logistics Zone that will include a natural gas power plant and refineries, the agency reported. On the first day of the new year, the Chinese flag flew beside Sri Lanka's at the port for the first time ever. The Chinese Harbor Engineering Company began 2018 with a $1 billion investment to build three 60-story office towers in Colombo. Rather than resist getting into further debt, Sri Lanka's government appears to be making more deals with China that it may yet struggle to pay back.